Ah, it’s that time of year again. The birds are singing. The flowers are blooming. The grass is getting green again, except on the CEU campus, which means only one thing: it’s baseball season. 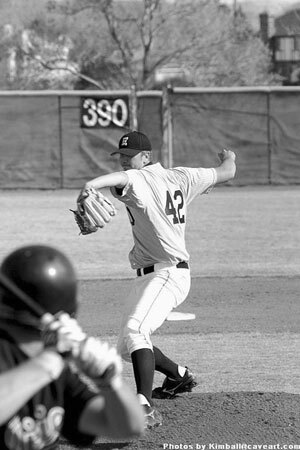 CEU’s baseball team actually started off their season some time ago with pre-season tournaments in Arizona and Salt Lake City. The Eagles traveled to Arizona on February 5-7 and took on teams from Arizona and one from Texas. The Eagles beat North Lake Community College (Texas) 8-1 in the first game of the tournament. However, things turned sour after that. The Eagles dropped the next five straight games of the tournament after that to Scottsdale Community College 4-3, Mesa CC 6-4, Phoenix Community College C 10-6, and Glendale Community College 3-0. All of these schools are from Arizona. When the Eagles returned, things didn’t get much better for a while. The Eagles traveled to Twin Falls to take on the College of Southern Idaho the weekend of February 21-22. CSI took both games 8-2 and 9-4 respectively. After that, the Eagles took on conference rival Salt Lake Community College and lost two straight to them by the scores of 11-1 and 1-0. Before things would get better for the Eagles, they only got worse. They did pick up a win over Colorado Northwestern 7-0 on February 27, but then had a very tough road schedule to start conference play. The Eagles started off against the defending national champion Community College of Southern Nevada. While Southern Nevada lost ten of their key players from last year, they are still the #1 ranked team among junior colleges in the nation according to the NJCAA. The Eagles played back-to-back double headers on Friday and Saturday the 5-6 of March and lost all four games 6-1, 3-0, 3-1, 7-2. The Eagles did play better when they hosted Miles City Community College of Montana, March 16-17. The first game was a close one, but the Eagles pulled it out by account of 6-5. After that, the Eagles took that momentum and won the next three games against Miles City 8-5, 11-3, 8-2. The following weekend, the Eagles hosted Colorado Northwestern for four games. With their newly found confidence, the Eagles were able to take the first three games from the Spartans 7-1, 4-3, 4-3. Colorado Northwestern surprised the Eagles in the final game on Saturday, scoring five runs in the first inning alone, winning the game 12-2. Having won 7 of their last 8 games, the Eagles are set to face Salt Lake Community College this weekend in Price. The Bruins have already beaten the Eagles twice this season, but the Eagles took one game from them during fall scrimmages. When asked how he felt about this weekend’s match up, coach Madsen said, “This is probably the best Salt Lake team I’ve seen. They’re beatable, though.” The Eagles play back-to-back double headers this weekend. Friday, the games start at 1:00 and Saturday, the first pitch is at 12:00.